The chain is like a blood vessel to your bike delivering life-giving power from your muscles to the rear wheel. 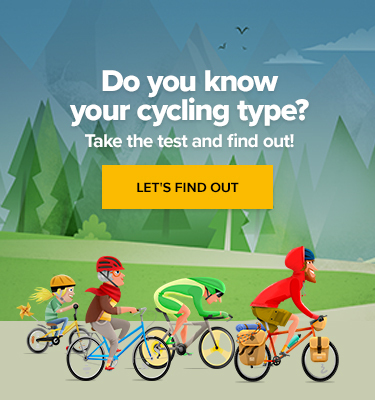 In order to cycle comfortably, you should keep it in a good condition. By lubing the bike chain before every ride, you’ll prolong its life and enjoy a smooth sound of its improved performance. For it’s not a rocket science, everybody can do it. Follow these 4 simple steps to do it right. Regardless of the lubricant you decided to apply, before any other action, you should just clean the chain thoroughly. Once you get used to it, the whole process will be a question of minutes. There is an incredibly wide range of lubes developed for various conditions. Weather is probably the most reasonable rule to follow when picking the right one which will fit you best. There are the wet lubes for the wet weather, snow, rain or slushy roads. Some lubes will do their work in a dry climate as they attract less dirt than the wet ones, however, you must reapply them more frequently, at least after every 200 km. 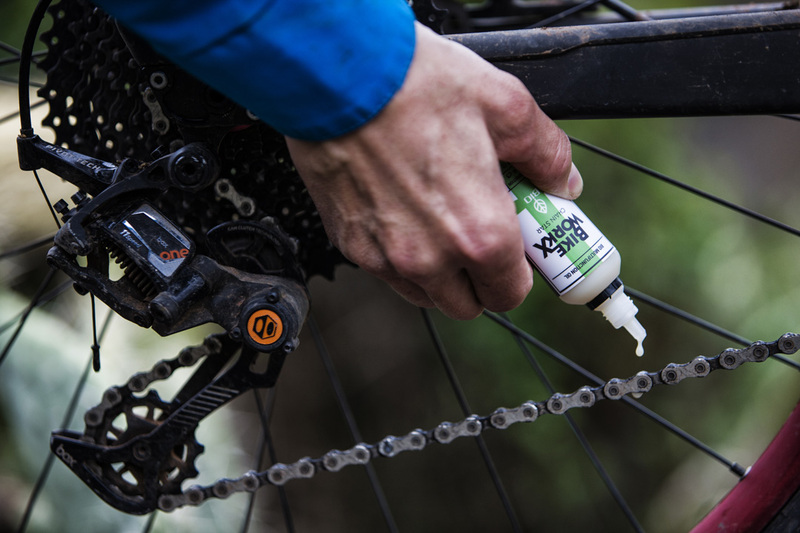 Despite lesser resistance against moistness and water, the lubes based on wax will keep your chain clean and your clothes less messy. That said, they’re likely to be used in arid climates. There are even advanced lubricants, such as Bike WorkX Chain Star, developed to penetrate chain links as fast as possible and stay on as long as it can hold. The fluid consists of two components – Vaseline, which proved to be one of the best lubricants, and a special kind of thinner that helps to get the Vaseline deep into the chain links. Once the thinner evaporates, Vaseline will do its best to make your chain running quietly. 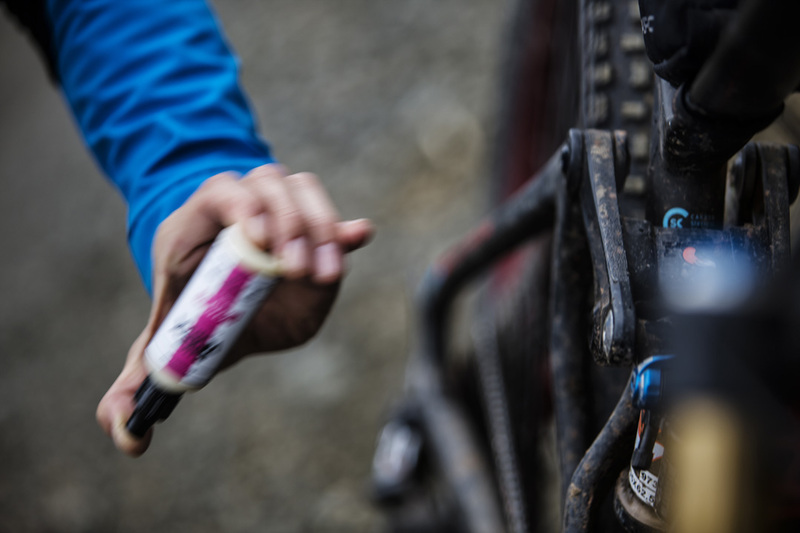 The die-hard riders who prefer drifting in mud would probably use some more durable agent containing even more sticky Vaseline-like substance as for example the Bike WorkX Extreme lube. Fit the bike so you can back-pedal freely. The service bike holder is the best, however, you can help yourself with propping the bike against a wall. Apply some kind of degreaser to the chain. You’ll get this stuff in every bike shop or even on the big mall’s shelves. For the next step, you’ll need a rag. The action doesn’t require any special fabric – your old One Direction band merchandise T-shirt will do a great job. Once degreaser is sprayed, hold the rag against the bike chain and with your free hand crank the pedals backwards so the chain would run through the rag. If the process results in chain slipping off the chainring, simply put it back and carry on cleaning. Pedal the chain a few times until it looks unsoiled. Usually, the lube consists of different components that get separated after some time of standing. In order to mix them together, shake the container thoroughly. Now squeeze the bottle so the liquid drops onto the chain. Once again, use your free hand to run the chain backwards so the lube sticks to the whole length of it evenly. By back-pedalling for another minute, you’ll help the lubricant to get to the chain links where it’s most needed. Many cyclists skip it, even though this is very important. Why? While there’s no need for the lube on the outside of the chain links, it may attract dirt and worsen the chain performance after a while. For wiping the chain off the excess lube, follow the step 2 only with using some other band’s rag.